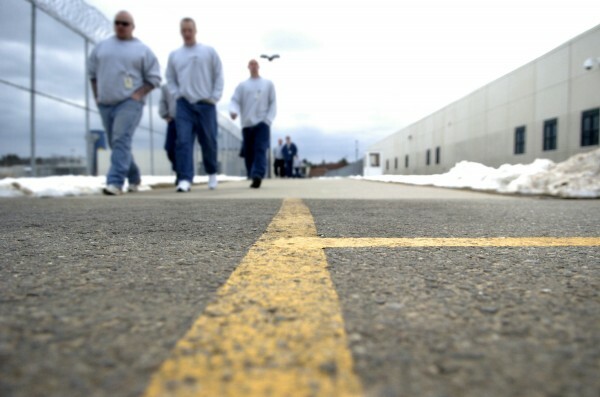 Inmates at Maine State Prison in Warren walk down an outdoor concourse that connects activity areas to cell blocks in April 2007. Maine has slowed its spending on health care for prisoners over the past decade but remains one of the highest spenders in the country, according to a study conducted by two national nonprofit organizations. The report, “ Managing Prison Health Care Spending,” was released Tuesday by the Pew Charitable Trusts and the John D. and Catherine T. MacArthur Foundation. Maine spent nearly $14 million on correctional health care costs in 2008, which amounted to 14 percent of every dollar spent on the prison system. The $6,740 average spent per inmate by Maine was the sixth highest of the 44 states examined as part of the study. But the Pew/MacArthur study also shows that the amount spent by Maine for prisoner health care has slowed from 2001 through 2008, more than nearly all the other states surveyed. “Nationwide, spending on both health care and corrections is putting serious pressure on state budgets. Medicaid — the largest component of states’ health care spending — has been the fastest-growing part of state expenditures over the past two decades, with corrections coming in just behind it,” the Pew/MacArthur report states. Maine was one of only five states studied (Nevada, North Dakota, Oklahoma and West Virginia are the others) in which the percentage of the state’s corrections budget consumed by health care fell, according to the report. Prison administrators had little time to review the report Tuesday and said they needed more time to analyze the reasons behind the current high costs and the savings per inmate, said Scott Fish, the director of special projects for the Maine Department of Corrections. He acknowledged that age is a factor in the high costs in Maine. Steve Lewicki, coordinator of the Maine Prisoners Advocacy Coalition, agreed that the demographics of Maine’s population — and by extension the state’s prison population — naturally lead to the high costs. Maine has the oldest median age in the country and older people generally consume more health care, he said. The Pew/MacArthur report found that nationwide the number of people serving life sentences from 1994 to 2008 had quadrupled, meaning prisons will have more elderly inmates who require more staff, special housing and more expenses, according to the report. The prison advocate also said that a diet without sufficient fresh fruits and vegetables is considered a factor in a high rate of diabetes among Maine State Prison inmates, which leads to higher health care costs. Lewicki said that the health care provided to prisoners has improved since a new company was given the contract to provide services to the Maine prison population. Correct Care Solutions received the state contract about a year and a half ago, Fish said, and $19.5 million is included in the fiscal year 2013 budget for that contract. “We have a very high quality of medical and mental health care,” Associate Commissioner Joseph Fitzpatrick added in a statement issued Tuesday by the department. Lewicki said while there are still concerns, including the availability of mental health services, overall prison health care services are better. When there are concerns, the administrator listens and responds, the advocacy coordinator said. “Complaints by prisoners are less,” Lewicki said. Spending on prisoner health care in Maine rose from $12.9 million in 2001 to $13.8 million in 2008. The increase was due, in part, to an increase in the number of people incarcerated in state prisons. There were 1,735 prisoners in the state corrections system in 2001 and that jumped 28 percent to 2,225 in 2008. The report found that nationally, the prison population jumped 15 percent from 2001 through 2008. “The dramatic increase was driven in part by tougher sentencing laws and more restrictive probation and parole policies that have put more people in prison and held them there longer,” the report states. The current prison population in Maine is down slightly from 2008 to 2,194. The report also found that states would save money by participating in the federal Affordable Care Act. The report stated that the act will cover people under 65 years old whose incomes are less than 138 percent of the federal poverty level and that nearly all prisoners fall into that income category.